Iain McNally ponders his route to the finish. Somehow I ended up being responsible for putting together an SOC team for this year’s Test Way Relay (thanks Roderick!). The Portsmouth crew took the first two legs with Jes Dickin leading off and handing over to Andrew Nash. Christine was also running the second leg but for Eastleigh. I was on the third leg, from Stokehill to Middleton. This isn’t one I’d done before and I failed to recce the route which probably cost me a minute or so due to hesitations and two points where I set off down the wrong track. In both cases I realised my error within about 20 metres so no great harm done. From there the Morans (Ian and Tamsin) took the team down to Stockbridge. The Currie clan stopped off for their traditional dip in the Test at Chilbolton Common. The sun had brought the hordes out but it didn’t make the water any warmer! By this point we were just 10 minutes behind my (unscientific) schedule. Kevin Bracher took us to Mottisfont and Philip Cooper from there to Romsey. Iain McNally was on the last leg down to Totton which is where things went a bit awry when he decided to check out the trout fishing possibilities. I’m not sure that it cost us any places but put us well over the five and half hours for the 44 mile route. The tide being in, Iain got even more intimate with the water on the way in to the finish. He didn’t, unlike one runner, try and build a bridge across! 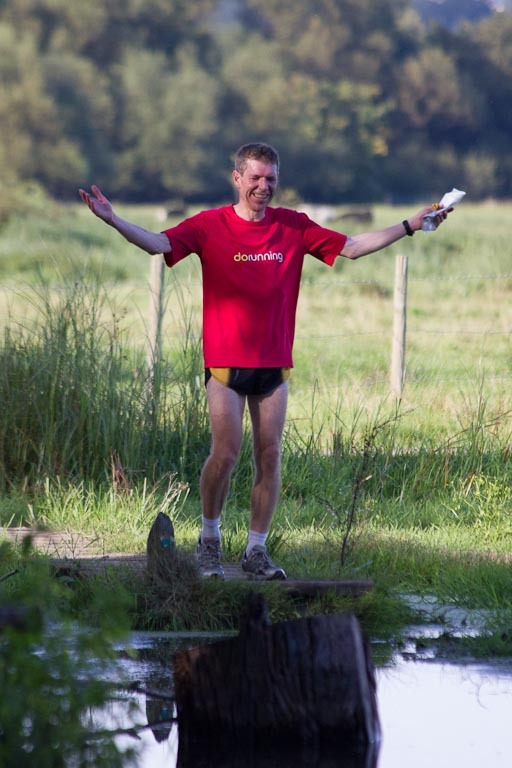 This entry was posted on Saturday, September 8th, 2012 at 9:19 pm	and is filed under Orienteering, Running. You can follow any responses to this entry through the RSS 2.0 feed. Both comments and pings are currently closed. Provisional results are now up and show us 10th out of 13 teams in a time of 5:50:45. Unfortunately they also show that Iain’s detour probably did cost us a place but we were some way behind 8th. Just received the splits for the relay. I can’t believe that I was 7th out of 13 runners on my leg – a full 7 minutes behind the fastest runner. Must try harder!